These workers went without jobs for three years during the strike that ultimately led to the founding of their co-op. They’ve been building tyres as worker-owners since 2005, selling them in the US and Mexico and now paying themselves the highest wage in the tyre industry. How does a workers' cooperative with 1050 members function? It’s hard enough for workers' ownership to succeed at any size, because any company that competes in a market is subject to the same cost-cutting rat race as a capitalist firm. Workers are impelled to hammer themselves and cut their own pay or be driven out of business. And most workers here have just a middle-school education. Yet the TRADOC co-op translation: Democratic Workers of the West—is thriving. Enthusiastic worker-owners have modernised their plant, increasing productivity and quality through their skilled work. Those factors together with their admittedly low prices have made it possible for them to compete on the world market. The strikers of Continental tyre, 2002-2005, were reluctant owners. When they fought the closing of their plant by the German multinational, all along they just asked for the owners to reopen it. At the end, Continental gave up and offered to sell half the company to the workers and half to its former distributor, Llanti Systems. “We said to Llanti Systems: ‘You buy the plant. Just hire us as workers and pay us our back pay,’” remembers Jesus Torres, who was then president of the striking union. “For us that would have been the biggest triumph, to reopen the plant and maintain our work. “It was our plant”, he told me. “We had been three years with nothing”. There was no light inside, so workers cleaned away cobwebs in the dark, bumping into machines and avoiding snakes and owls. “It was a cadaver when we went in”, Torres said. One problem the new co-op had at the beginning was too many workers on the payrol l— but they weren’t about to lay anyone off. They also had a new brand name, Pneustone, which the public didn’t know. And the aid that Continental pledged never came. The company had said it would sell the co-op raw materials, buy the plant’s production, and give technical advice for a year. None of these promises were kept. Continental said it could get the tyres cheaper elsewhere. For the first four years, the new company was in the red. The first tyres were sold very cheap, at a loss, to Walmart. Co-op leaders knew the key to survival was to obtain raw materials at a good price, something only a large company could guarantee, and that it would be much better if that company distributed tyres in the US. So they sought a new, international partner. In 2008 Cooper tyre, based in Findlay, Ohio, injected new capital; it now owns 58 per cent of the Corporación de Occidente (COOCSA), or Western Corp., with the TRADOC cooperative owning 42 per cent. Cooper has four members on the Administrative Council and TRADOC three; decisions can be made only if 75 per cent agree, or 100 per cent for important decisions such as investments or asset sales. In other words, all management decisions are made by agreement between the two entities. Western Corp. buys raw materials from Cooper, and Cooper buys 95 per cent of the factory’s output, most of it for sale in the US. Ironically -— since they had fought their own closing so hard — the TRADOC workers were the beneficiaries of a Cooper closing in Georgia, when they bought that plant’s machinery. Making a tyre is like making a cake, Torres says. There are recipes — it’s really a chemical process. Different types of rubber come in from Malaysia, Guatemala and Singapore, used for different parts of the tyre: its walls, its floor. One of TRADOC’s three mixers, where petroleum is added to molten rubber, is the largest in the world, two stories high. Steel — as in “steel-belted tyres” — and nylon are threaded in at a later stage. At every step, the consistency of the rubber mixture is tested by technicians, and at the end, a number of quality checks result in a discard rate of 1.8-2.5 per cent. The number of different computerised machines that knead or shape the rubber is staggering; the El Salto plant is more than half a mile long. And near the end, workers and machines work in tandem to pull the parts together. I watched a top-seniority tyre builder named Carlos, who because of his productivity makes one of the highest wages in the plant, move eye-blurringly fast to place and tug the strips of rubber, one tyre at a time. This happens 15,000 times a day, 4.2 million times in 2012. “The fact that a tyre is so hard to build makes it even more impressive that we’re doing this”, says Torres immodestly. Worldwide, tyre building is continually modernising and requires steady investment. New younger members, the “black belts”, are looking at how to improve the process. For example, they’d like to cut down on the use of solvents and thereby avoid skin problems. They will figure out a new product and how much it would cost for the whole plant, and make a presentation. One of the simplest gains under the new system was to do away with foremen. “It was easy”, Torres said. “Each worker knows his job, knows the quota. They don’t have to be watched.” Quotas are set low enough that many workers finish a couple hours early and relax till quitting time. Nor is there a janitorial department; workers clean their own areas. TRADOC holds a general assembly only twice a year, but that assembly holds veto power over important decisions such as selling assets, making investments and buying machinery. For example, partnering with Cooper was approved by the assembly after an intense debate, but with an overwhelming majority. Meetings feature much debate, with successful proposals coming from the floor, not only from the leadership. In the day-to-day running of the plant, the Administrative Council makes decisions. A plant manager who is not part of the co-op oversees all activities, but of course can’t make unilateral decisions. “And so far, this structure has worked almost perfectly”, Torres says. The joint venture hasn’t hesitated to rehire technicians, engineers and specialists who worked for years under the old management. There’s no question that the cooperative is all about “working smarter”. For a person who preached the evils of the “team concept” and labour-management cooperation programs throughout the 1980s and 1990s, it was jarring to see some familiar slogans resurrected under a different ownership structure. The hallmarks of the team concept are workers monitoring each other and competing to come up with labour-saving suggestions. When one worker said, “Now we pressure each other to do it right the first time”, I had to remind myself where I was. But isn’t this what team members ought to do, when we’re all on the same side? Isn’t the number of sides — one or two — the nub of the matter? The team concept claims to produce worker dignity and satisfaction by soliciting workers’ ideas to increase someone else’s profits. When the profits are yours and your fellow workers’, the dignity and satisfaction can be real. A bulletin board notice congratulated member Joel Gutierrez for his idea that saved 12-25 tyres per day from the scrap heap. It’s the type of notice that could be found in any plant, but here with different implications. “Though some slogans may be similar”, Torres said, “in TRADOC, collective interest prevails”. And the collective can choose how to balance its different goals — note the high salaries and early quitting times. Rosendo Castillo of the co-op council says members want to invest in machinery that will save them from heavy labour — even though this presumably means fewer jobs in the short term. Though it’s risky to extrapolate too much from one plant tour, I found an atmosphere where no one seemed stressed, a feeling of quiet competence (though Carlos was moving mighty fast). I asked one lab tech whether he felt pressure from his co-workers to ignore bad test results in order to keep production moving. “Ignore them never”, he said solemnly. “Responsibility is a way of life”. The co-op began with equal salaries for all. This led to problems, Torres explained. “Some said, ‘Why should I work harder if at the end of the day, I make the same money as the rest of you?’” When leaders proposed a salary scale, the assembly was nearly unanimous in favor. Now there are seven pay levels, 2 to 8, with most workers at the 5-7 rates and very few at 2 or 3, which are mostly for new hires. Under the precept “equal work, equal pay”, the monthly salary is determined by physical effort and responsibility. Seniority determines who can transfer to an open job. In the industrial corridor where the plant is located, usual factory pay is US$192-$384 a month. In TRADOC workers in the 5-7 range make $240-$375 a week. Members of the administrative council get the same as the highest-paid worker. In Mexico the government pension (the equivalent of social security) is based on what the employer pays into the system in one’s last five years worked. So TRADOC pays in at a very high rate for those five years, enough to secure every worker $1500 a month, nearly as much pay as when they were working. 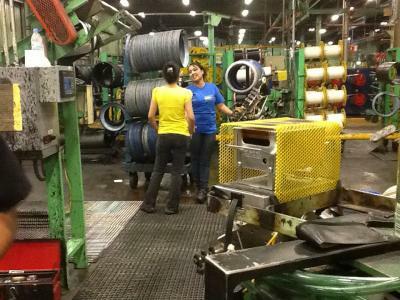 Not surprisingly, everyone in El Salto would like to work at the tyre factory. Workers have kept the openings for their family members, including 25 daughters, the first women to work in production. I spoke to a young mother with two children, whose father got her in. She plans to stay, she said. When the workers took over, says Torres, “we knew how to make tyres, but we didn't know how to sell them”. That’s why they needed a capitalist partner, and still do. But they know their arrangement with Cooper may not last forever. Cooper is an anti-worker company, after all. In 2012 it locked out its US workforce, seeking deep concessions, successfully. When TRADOC sent a letter of solidarity to the union (which was never answered), management was furious. “We have a history we're not going to deny”, Torres told the Cooper managers. “Our class is the working class. We are the co-op. We have the plant. You sell the tyres”. But looking down the road, TRADOC wants to be prepared to take over sales — which is where the most profits lie. The next general assembly will hear a plan to open a tyre store in the nearby big city of Guadalajara. In elections for the co-op council held every three years, there’s always a right-wing and a left-wing slate. The right argues that members should pay attention only to their own plant, and ignore workers’ struggles elsewhere. They also want higher pay, for the “management” positions they’re seeking. Thus far the left has won handily. So the co-op has a solidarity fund, a couple of dollars a week from each worker’s pay. They publish a bimonthly paper of labour news, the Workers’ Gazette, and help support locked out electrical workers and miners, fired Honda workers, campesinos imprisoned for defending their land. “This isn’t new”, explains Torres. “Our union was always very solidaristic. We sent money to the Spanish Civil War” in the 1930s. But once the co-op started: it’s a pleasure to relate that workers really do run a factory better than the bosses. Not only do they control the plant floor, with no need for overseers, they come up with ideas to improve production in both senses: more and better tyres, less scrap — but also fewer backbreaking jobs. With about the same workforce, the plant is producing 50 per cent more tyres than before it was closed. Workers have introduced new machinery to boost productivity, but so do most enterprises. Corporations also use speed-up, pay cuts, and a total disregard for the environment. Those things won't happen at this co-op.